Iowa U.S. Senator Chuck Grassley says, “Shutdowns are not a way to do business,” and he’s hopeful the president and Democrats who control the U.S. House will be able to reach a compromise very soon. On this 17th day of the partial federal government shutdown, President Trump will address the nation tonight in his first-ever speech from the Oval Office. President Trump plans to visit the U.S.-Mexican border later this week to emphasize his call for building a wall, which is the main sticking point between the White House and Democrats. 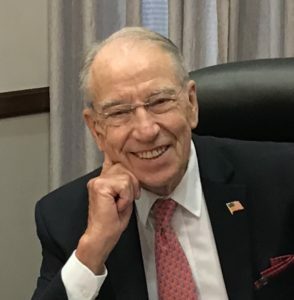 Grassley, a Republican, says both sides have to be willing to give in order to reach accord and bring federal workers back from furlough. Multiple federal agencies ran out of money on December 22nd as Congressional Democrats blocked Trump’s request for $5.7 billion for the border wall. House Democrats passed a bill last week that included one-point-three billion dollars for border security, but the measure has not yet been taken up in the Senate, where Republicans hold the majority. The president’s address is scheduled for 8 PM Central time.